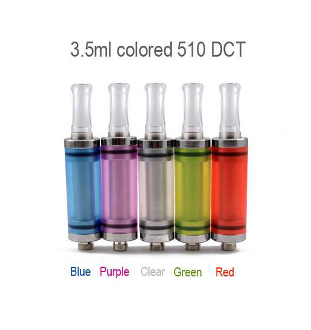 The DCT Dual Coil 510 Tank is a great clearomizer. It is made of sturdy plastic and stainless steel. It is also rebuildable and easy to use. You gets lots of great vapor and flavor with this one. They come in two sizes, 3ml and 6 ml. You will get several days of vaping from these clearomizers before you'll need to fill them. The maintenance for these DCT tanks is minimal. Replacement just involves sliding the DCT Atomizer out of the bottom of the tank completely and replacing it with a new one. Simple as that. Compatible with: Dual Coils Dct Atomizer.